» Celebrating the 229th anniversary of Emperor Quang Trung’s coronation and Ngoc Hoi - Dong Da victory. Born in as far as the North, living in Ho Chi Minh City, but Mr. 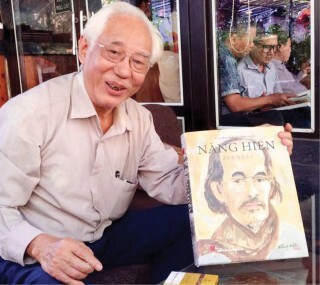 Vu Kim Loc, a well-known figure among antique collectors in Vietnam, is doing a job that few people think of: restoring hats of the emperors of the Nguyen Dynasty in Hue, the last feudal dynasty of Vietnam. What is left of the 4 hats; out of shape; gold and precious stones have been removed; packed in the two bags. On the first days in Ho Chi Minh City, Loc worked as a jeweler. That job enabled him to get in contact with ancient jewelry and gradually he became keen on collecting antiques without knowing. “I am especially interested in antique statues and the thing that impresses me most is the hat. Informed by other antique collectors, I go anywhere I can find statues. I also read lots of historical books and collect pictures. Gradually I build up for myself a rich source of documents for my passion,…” recalled Mr. Loc. Day after day, he has been taking pain to collect anything related to hats, most of which are hats of the Nguyen Dynasty. However, at the time, he just thought of collecting, but not restoring. One day 10 years ago, he happened to meet an antique collector. He gave Loc a mess of things of gold, saying that it was what remained of a hat of a Cham king and asked if Loc could restore it. “I soon accepted his request out of passion,” continued Loc. “With my experience as a jeweler, I found ways to do all bits and pieces, from knitting the frame to making the mold. After many failures, the hat was eventually restored successfully.” When shown to the scientific committee, the hat satisfied all the members. Since then Loc became well known and prestigious in the circle of researchers and conservationists. To the artisan Vu Kim Loc, restoring hats of the Nguyen emperors is his predestination and endless passion. A litter while after he had successfully restored the hat of the Cham king, to Mr. Loc’s surprise, he was asked by the Museum of Vietnam History to restore the four hats of the four kings of the Nguyen Dynasty. These four hats are among the treasure left by the Nguyen Dynasty, consisting of gems, seals, swords, objects, etc. and had been kept by the government before handing them to the Museum. It was Uncle Ho who determined to keep these 4 hats (3 for Great Services and 1 for Nam Giao Sacrificial Ceremony) for younger generations to see. However, time and bad preserving conditions had made the hats out of shape; gold and precious stones had been removed. They all had been packed in the two bags. “When Dr. Pham Quoc Quan, the then Director of the Museum of Vietnam History, asked me to open the two bags with the hats inside in the presence of many members of the Museum, I was so overwhelmed and moved. It was beyond my imagination. But it was the belief that people had in me and my respect for history that urged me to decide to fulfill that difficult mission,” recalled the talented artisan. Soon after that, Mr. Loc packed his luggage and booked tickets to Hue. 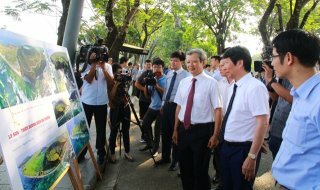 Contacting Hue Monuments Conservation Center, he got the permission to visit royal mausoleums and palaces to observe, collect data, and take pictures in preparation for restoration. 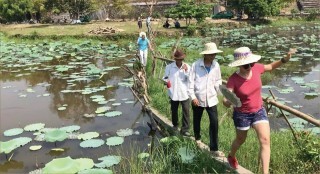 Vu Kim Loc (in white) and museum experts are working on hats of the Nguyen Dynasty. On his days in Hue, he found ways to museums, temples, royal mausoleums, etc., to conduct surveys and researches. He collected paintings and photos of the emperors. One day, when he visited Ung Lang, the resting place for emperor Khai Dinh, he was taken aback when he saw the bronze statue of the king. He recognized the hat on the statue was similar to the one that the Museum had given him to be restored. “I had to ask for priority to come close to the statue, so that I could watch the hat closely and took pictures of all the details of the hat. I soon realized that the restoration was now within my reach,” said Mr. Loc. After the three field trips to Hue with the assistance of experts and researchers both in and out of the country, Loc set out to restore the hat. There were times when I thought I met a dead end because in the restoration process, I suddenly found what I was doing did not match the photos, or I could not decide on the hat size. Especially, I did meet with various difficulties about how to arrange details and patterns on the hat or how to weave copper threads to make the frame. But with all my effort, passion and the good combination of many traditional professions and skills, the four hats of the Nguyen Dynasty had been successfully restored after a long period of 11 months. 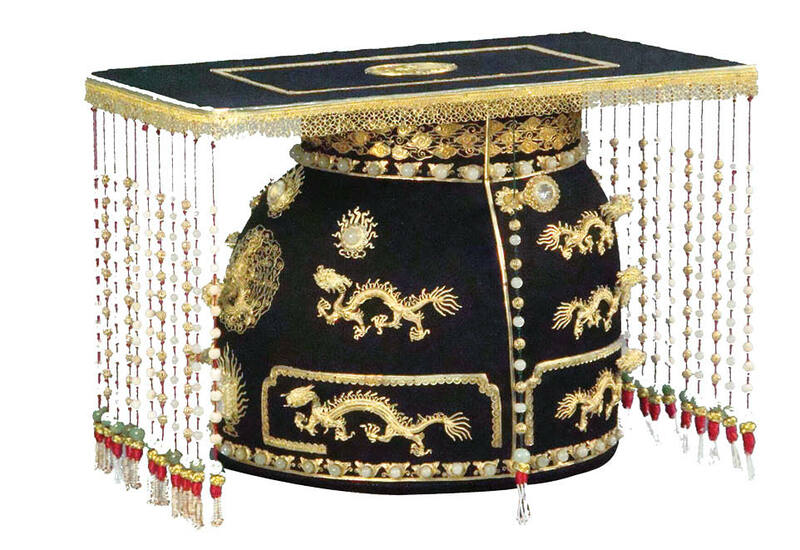 On each hat for Great Services, there is 31 dragons of gold, 30 square flowers of gem, 140 diamonds and pearls; the hat for Nam Giao Sacrificial Ceremony has 12 dragons, 24 ribbons knitted with pearls and precious stones. When the hats were shown to the consultant council for acceptance, they were very highly valued. According to Dr. Pham Quoc Quan, former Director of the Museum of Vietnam History, Vu Kim Loc’s restoration of the hats of the Nguyen Dynasty was priceless. 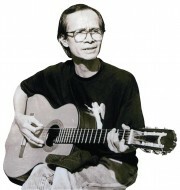 Mr. Quan recalled when he assigned that special task to Mr. Loc, he completely trusted him. And he was right. By his skillful hands and with his experience, the four hats had been restored to perfection. Those treasures have later been on display at many museums throughout the country. They were even displayed in France and Japan. “In addition, he also took charge of other hats, starting a new way in conserving the costume of the Nguyen imperial court. I think besides repairing and conserving artifacts, it is time to think about how to train other people too, so that they are able to restore such treasures,” said Dr. Pham Quoc Quan, former Director of the Museum of Vietnam History.